The world of science was abuzz last week with the report that physicists involved in the BICEP2 project (Background Imaging of Cosmic Extragalactic Polarization 2) using a telescope at the South Pole to analyze the polarization of light from the early universe had detected the imprint of gravitational waves that had been stretched by the process of cosmic inflation a trillion-trillion-trillionths of a second after the Big Bang 13.7 billion years ago. In view of all the excitement, some reflection on the nature of the alleged discovery, its reliability, and its significance is advisable. One of the things that bothered Albert Einstein about Newton’s theory of gravity was that gravitational force, in Newtonian conception, acted instantaneously across any distance without any discernible medium that carried the force. Two massive objects on opposite sides of the universe have an instantaneous effect on each other that is proportional to their respective masses and inversely proportional to the square of the distance between them. For instance, the motion of planets around the Sun in our solar system redistributes matter in a way that instantly changes the gravitational field on the other side of the universe. Einstein’s 1915 theory of general relativity changed this. In 1905, with his special theory of relativity describing non-accelerated motion, he found that the speed of light was the limiting velocity at which any cause could have a spacetime effect. His theory of general relativity, which extended his analysis to accelerated motion and gave an account of the nature of gravity-induced motion in terms of the curvature of space-time (roughly, matter tells spacetime how to curve and spacetime tells matter how to move), predicted the existence of gravitational waves that propagate at the speed of light. In other words, general relativity eliminated the action-at-a-distance in Newtonian gravity by describing gravitational effects as ripples in spacetime that propagated outward from massive objects at the speed of light. This much established, as the physicist George Gamow demonstrated in 1948, one of the predictions of Big Bang theory is the existence of gravitational ripples and cosmic background radiation (CBR) that are an “echo of Creation”, as it were, throughout the whole observable universe. This cosmic background electromagnetic radiation was discovered in 1965 by Robert Wilson and Arno Penzias, a discovery for which they were awarded the Nobel Prize for confirming one of the main predictions of Big Bang cosmology. In this regard, the alleged detection of gravitational waves would serve as further confirmation of the correctness of Einstein’s theory of general relativity and of the nature of the Big Bang itself. If corroborated by the scientific community, it would be a hugely important discovery, not just because of the evidence it provides for gravitational waves, but also because of the way this discovery is linked to another theory, namely, inflationary cosmology. As implied in the opening paragraph, if gravitational waves have been detected by their effect on the polarization of light from the early universe, it is because this effect has been amplified to detectable size by cosmic inflation in the first 10-37 to 10-35 of a second after the universe exploded into existence. According to the hypothesis of cosmic inflation, during this incredibly small period of time, the universe expanded at a velocity exponentially faster than the speed of light (this would not violate special relativity because it is not describing motion within spacetime but rather the expansion of spacetime itself). I will say more about the justifications and implications of inflationary cosmology presently, but the first thing we need to address is the reliability of these recently reported results, and in this respect there are ample grounds for being tentative. Polarization of the CBR from the Big Bang is regularly observed and attributed to magnetic fields in space produced by intervening galaxies or intergalactic dust. The BICEP2 scientists attempted, to the best of their ability, to get a look at the CMB apart from such known polarizing factors and discovered that, insofar as they succeeded, the polarization was still there. The search for another source of this polarization yielded the suggestion that gravity-wave compression of matter in the early universe could have such a polarizing effect, but in order for it to be large enough to match what was observed, it would require amplification that only something like cosmic inflation could provide. Further study revealed that if the dials on gravity-wave compression and inflationary expansion were tweaked in just the right way, and a reasonable guess at polarizing dust interference was accommodated, a moderately significant polarization signal remained above the noise that could be explained by carefully selected gravitational and inflationary causes. In short, there’s a lot of room for doubt about the proposed explanation of the data and ample room for more conventional explanations to prove adequate to the task (for more on this, see Rob Sheldon’s article referenced in the further reading suggested at the end of this post). Nonetheless, if these results hold up to extended critical scrutiny, some Nobel Prizes will likely be forthcoming. With the tentativeness of these results firmly in view, we need to examine the reason that cosmic inflation was first proposed. Alan Guth suggested an inflationary mechanism in 1980 to explain why the temperature of the cosmic background radiation was the same throughout the observable universe to one part in a hundred thousand, and why the density of mass-energy resulting from the Big Bang yielded a universe that was flat to at least one part in a quadrillion (explanatory demands known respectively as the “horizon” and “flatness” problems). 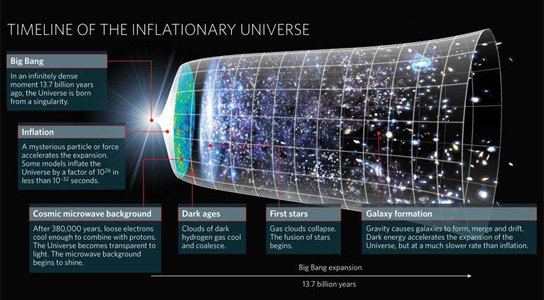 Inflation is therefore intended to explain away the fine-tuning of certain physical quantities intimately connected to the Big Bang origin of our universe, especially since this thermodynamic connectedness and homogeneity seems necessary if our universe is to be capable of supporting life. In short, inflation was invoked to provide a physical rather than a transcendent metaphysical explanation for our universe’s fine-tuned life-supporting properties. The irony of the proposal, at least in regard to the sensibilities of those inclined to scientific materialism, is that inflationary processes actually increase rather than decrease the required fine-tuning associated with our universe. For instance, the energy of the inflationary field has to be shut off with tremendous precision in order for a universe like ours to exist, with inflationary models requiring a shut-off energy precision of at least one part in 1053 and perhaps as much as one part in 10123. Furthermore, inflation is an entropy-increasing process (it increases the thermodynamic disorder of the cosmos), yet even without it, as Roger Penrose has shown, the universe’s initial entropy was fine-tuned to one part in 10 to the 10123 power. In other words, adding an inflationary process to the already hyper-exponentially fine-tuned entropy required by the Big Bang exponentially increases its hyper-exponential fine-tuning. What is more, as theoretical cosmologists Sean Carroll and Heywood Tam demonstrated in 2010, the chance of an inflationary process producing a realistic cosmology is only one in 10660,000,000. (3) Thirdly, at least two paradoxes result from the inflationary multiverse proposal that suggest our place in such a multiverse must be very special: the “Boltzmann Brain Paradox” and the “Youngness Paradox”. In brief, if the inflationary mechanism is autonomously operative in a way that generates a multiverse, then with probability indistinguishable from one (i.e., virtual necessity) the typical observer in such a multiverse is an evanescent thermal fluctuation with memories of a past that never existed (a Boltzmann brain) rather than an observer of the sort we take ourselves to be. Alternatively, by a second measure, post-inflationary universes should overwhelmingly have just been formed, which means that our existence in an old universe like our own has a probability that is effectively zero (i.e., it’s nigh impossible). So if our universe existed as part of such a multiverse, it would not be at all typical, but rather infinitely improbable (fine-tuned) with respect to its age and compatibility with stable life-forms. (4) Fourthly, a mechanism that generates universes ad infinitum must have stable characteristics that constrain its operation if it is to avoid breaking down and sputtering to a halt. In short, universe-generators have finely-tuned design parameters that themselves require explanation. So postulating a universe-generator to explain away the appearance of first-order design in a single universe does not obviate the inference to design, it merely bumps it up to the next level. Avoiding an infinite regress of explanatory demands leads to the recognition of actual design terminating in an Intelligence that transcends spacetime, matter and energy, and which, existing timelessly logically prior to creating any universe or multiverse, must also therefore exist necessarily, and therefore require no further explanation of its own existence. Barnes, Luke. (2011) “The Fine-Tuning of the Universe for Intelligent Life” (arXiv:1112.4647v1). Barrow, J.D., and Tipler, F.J. (1986) The Anthropic Cosmological Principle. Oxford: Oxford University Press. Borde, A., Guth, A., and Vilenkin, A. (2003) “Inflationary spacetimes are not past-complete” (http://arxiv.org/pdf/grqc/0110012.pdf). Carroll, S., and Tam, H. (2010) “Unitary Evolution and Cosmological Fine-Tuning” (arXiv:1007.1417v1). Collins, Robin (1999) “A Scientific Argument for the Existence of God: The Fine-Tuning Design Argument,” in Michael J. Murray, ed. Reason for the Hope Within. Grand Rapids: Eerdmans, pp.47-75. _______. (2003) “Evidence for Fine-Tuning,” in N. Manson, ed. God and Design: The Teleological Argument and Modern Science. New York: Routledge, pp.178–99. _______. (2009) “The Teleological Argument: An Exploration of the Fine-Tuning of the Universe,” in William L. Craig and J.P. Moreland, eds. The Blackwell Companion to Natural Theology. Oxford: Blackwell, pp.202–81. _______. (2013) “The Fine Tuning Evidence is Convincing,” in J. P. Moreland, Chad Meister, and Khaldoun A Sweis, eds. Debating Christian Theism. New York: Oxford University Press, pp. 35-46. Copan, Paul, and William Lane Craig. (2004) Creation out of Nothing: A Biblical, Philosophical, and Scientific Exploration. Grand Rapids: Baker Academic. Gordon, Bruce L. (2010) “Inflationary Cosmology and the String Multiverse,” in Robert J. Spitzer, S.J. New Proofs for the Existence of God: Contributions of Contemporary Physics and Philosophy. Grand Rapids: Eerdmans, pp.75-103. _______. (2011a). “A Quantum-Theoretic Argument against Naturalism,” in Bruce L. Gordon and William A. Dembski, eds., The Nature of Nature: Examining the Role of Naturalism in Science. Wilmington: ISI Books, pp.179-214. _______. (2011b) “Balloons on a String: A Critique of Multiverse Cosmology,” in Bruce L. Gordon and William A. Dembski, eds., The Nature of Nature: Examining the Role of Naturalism in Science. Wilmington: ISI Books, pp.558-601. _______. (2013a) “In Defense of Uniformitarianism,” Perspectives on Science and the Christian Faith, vol. 65, no. 2, pp.79-86. Guth, Alan H. (1997) The Inflationary Universe: The Quest for a New Theory of Cosmic Origins. Reading: Perseus Books. Holder, Rodney D. (2004) God, the Multiverse, and Everything: Modern Cosmology and the Argument from Design.Burlington: Ashgate. Steinhardt, Paul. (2011) “The Inflation Debate,” Scientific American, v.34 (4), 36-43.